Hypertension and obesity are a dangerous mix. Excessive weight gain increases blood cholesterol level, and affect kidney functions, leading to raised blood pressure or hypertension. See when to start treating hypertension in the obese and simple steps and medications that will help. Over a dozen large population based medical researches have consistently shown that people who are obese have more than 30 percent chance of becoming hypertensive. That means that hypertension and obesity are not just a coincidental occurrence. 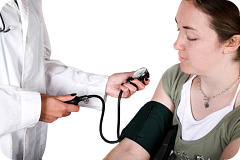 If you already suffer with high blood pressure, excessive weight gain would worsen your blood pressure. Conversely, it has also been shown that the single most important treatment of hypertension in the obese is weight reduction. As little as a ten percent weight loss will help bring down your blood pressure and improve your health. Cure your obesity, and control your high blood pressure. It is do-able! Impotence or Erectile Dysfunction in men. You can see that to be obese is to court so many unnecessary health problems, and waging a firm war against obesity will greatly improve one's health. A sensible and realistic dieting program combined with exercise is the first step in achieving effective weight control. In these days of high tech, you do not need to be physically in a gym for a great workout. Where you have tried diet and exercise without good effect, it might be time to include a weight loss medication or even weight loss surgery. It is critically important to take what steps you can, to find treatments and cures that work for you. But what is the target blood pressure for the obese and what can you do specifically to overcome obesity and hypertension? Hypertension or high blood pressure is the presence of a high level of tension or force being exerted on the wall of your arteries due to blood flowing at abnormally high force. It's like pushing water down a hose at a very high pressure. In proper medical parlance, hypertension is said to occur if your blood is greater than 140/90mmHg consistently after more than two readings at different times. Normal blood pressure is usually anything between 90/60mmHg to 120/80mmHg in the young, and no more than 140/90mmHg at any age. The definition of hypertension is thus a quantitative reference. For anyone to be diagnosed with hypertension, their blood pressure reading has to be taken at least twice over three different occasions. A persistently high blood pressure above 140/90mmHg in anyone up to the age of 65 will meet the criteria for the diagnosis of hypertension. Most people would not require treatment for high blood pressure until they have a persistently raised blood pressure of 160/90 or more. The target blood pressure in the obese should not be higher than 140/90mmHg. A lower threshold (of 140/90mmHg) is required to treat hypertension in any one with a BMI of more than 28! Hypertension and obesity are truly an unholy mix. Do something about it today. You can monitor your blood pressure at home by getting a blood pressure measuring device from reputable international medical equipments store like MedexSupply and check your blood pressure weekly. Be sure to get a device with a cuff width that covers up to 75% of your arm length and the length of the cuff should be three times the width, or be able to go round your arm almost twice. Getting the wrong cuff size will give you a false blood pressure reading. Numerous clinical and animal studies have show a clear causal relationship between hypertension and obesity. The American Heart Association in 2005, reports that an "accumulating evidence points to visceral obesity as the most important risk factor for hypertension". Leptin is a hunger and obesity regulating hormone in humans. When we are well fed, leptin is produced in sufficient amount by the fat cells in our adipose tissues. This sends a signal to our brain that we are okay, and the hunger system is switched off, so that you feel satisfied. When we starve, the leptin level drops, and the brain activates our hunger system in the hypothalamus. This causes us to seek food and eat. In the obese, they tend to develop what is called leptin resistance. Their brain cannot see that they are "fat", and thus more and more leptin is produced when they eat; yet the brain still fails to switch off the hunger center. Excess leptin leads to the stimulation of the nerves that cause increased blood pressure called the sympathetic nervous system. Another causal connection between hypertension and obesity could be seen from the fact that being obese substantially increases one's total body cholesterol and triglycerides. It is reported that every 2.2lbs increase in body weight leads to a 2 point increase in cholesterol level. We know that increased cholesterol clogs the veins and arteries, leading to hypertension and heart attack, just like narrowing the diameter of a garden hose leads to increase in the pressure at which the water will flow out. A third way in which obesity leads to hypertension is in the effects on the kidneys. There is a substance called angiotensinogen usually produced in the adipose tissue, and gets to the kidneys, and help regulate salt and water conservation in the body. Recent studies have confirmed that obesity leads to very high level of angiotensinogen, leading to an excessive accumulation of salt and water in the blood system of the obese, and causing high blood pressure, just like increasing the volume of water running through that garden hose suddenly would also increase the pressure inside the hose. We can see that hypertension and obesity are so closely linked, and losing weight greatly reverses the effect of obesity on high blood pressure. As mentioned earlier, if you are obese and have high blood pressure, please ensure that your blood pressure never gets above 140/90mmHg. If it is higher than that at the moment, you need to see your doctor. After two or three checks and if it remains high, it is time to treat both the hypertension and obesity. For the treatment of blood pressure, there are several different medications available, and the choice of the right medication will depend on your age, race, and presence of other medical conditions and allergies. So it is vital that you see your own doctor to assess you for the right medication for you. As a brief guide, the initial management of hypertension in anyone below 55 years of age and is not of the Afro-Caribbean race, is the use of a group of medications called the Angiotensin Converting Enzyme Inhibitors (ACE Inhibitors) like Lisinopril, 5 or 10mg daily depending on how high the levels are, if not allergic to this medication. For anyone 55 years or more, or of Afro -Caribbean extraction at any age, who is hypertensive, the right initial choice of blood pressure medication would either a calcium channel blocker like Amlodipine, 5mg to 10mg once daily, or a diuretic like Hydrochlorothiazide 12.5mg once daily or bendroflumethiazide, 2.5mg once daily. Other classes of medications can be added to the above where the blood pressure is not responding to the initial medication choice. Treating your blood pressure alone is never going to cure it. You can completely cure your high blood pressure by losing weight. Bariatric surgery. See if you meet the criteria for weight loss surgery here. Obesity-Associated Hypertension. New Insights Into Mechanisms. Kamal Rahmouni; Marcelo L.G. Correia; William G. Haynes; Allyn L. Mark. Hypertension. 2005;45:9-14. American Heart Association, Inc. Hypertension: The Silent Killer . By Luzano Pancho Canlas. Infinity Publishing (PA) (October 16, 2002) Pages 49 & 50. Hypertension and Obesity: Have Your Say! Do you or your loved have high blood pressure and are overweight as well? Having problems controlling your weight or blood pressure? Wondering if you can get any further help or great ideas? Or just have a question or comment on this topic? Share it here! Get your weight and blood pressure issues discussed by medical professionals and take that burden off your mind. Post your thoughts below. Your story will appear on a Web page exactly the way you enter it here. You can wrap a word in square brackets to make it appear bold. For example [my story on weight and blood pressure ] would show as my story on weight and blood pressure on the Web page containing your story.